Now that you have decided to tie the knot with the woman you love, you need a wedding band for yourself. While most men would love to buy the traditional gold ring, not everyone can really afford it. 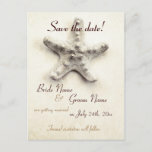 There are others who would just like to go for something different and yet inexpensive. 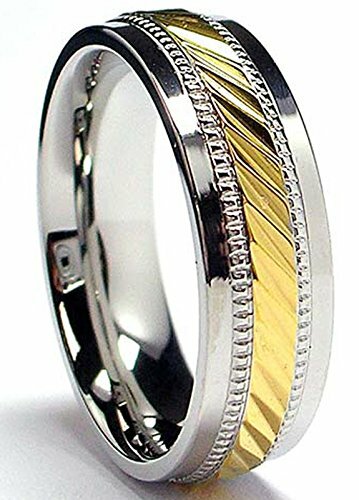 If you are looking for cheap men's wedding bands, there are quite a few options available for you. 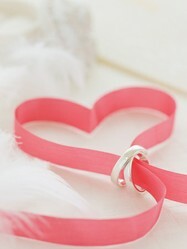 The only thing that you need to do is look around for the perfect ring depending on your style and your life. There are quite a few things that you should consider before buying your cheap men's wedding band. Take a look at some of these things and then choose the perfect fit for yourself. The first thing you should think about is the width. Choose a wider one if you have long fingers. Usually, 6-7mm is a perfect fit for men. However, if you have shorter fingers, you may want to try out a 5mm ring. You may want to go for something wider than 7mm. However, these can be uncomfortable to wear so choose carefully. Consider also the size of your fingers. Wider rings will be tighter around your fingers than the narrower ones. So, you will need to choose a larger finger size in this case. Gold is usually the preferred metal. However, we do know it is expensive and we are here looking for cheap men's wedding bands. If you can afford it and like wearing gold, nothing should stop you from going for it. Platinum is another material which is quite popular. This again is expensive. You could go for sterling silver which is usually more affordable and looks classy too. 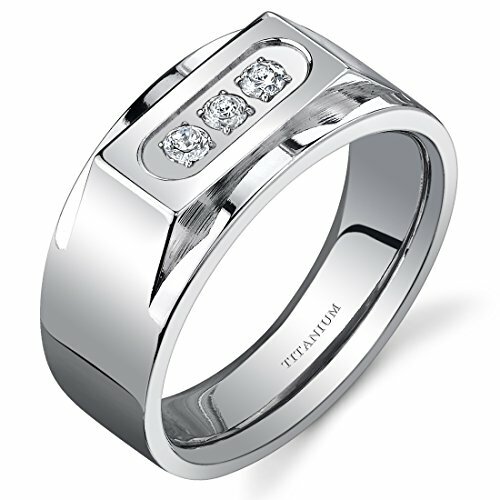 More and more men are going for titanium and tungsten wedding rings these days. This is simply because these metals are durable and yet lightweight. These are also quite cheap so make sure to consider these as options. Titanium is much preferred by men and even by women because it maintains its original appearance for many years. It won't lose its color or tarnish even after years of wearing. Tungsten is a hard metal and it doesn't scratch or bend as easily as gold. The metal is combined with carbon to make the ring. So, you get a tungsten carbide ring. Another material that you should consider is stainless steel. It is lighter than tungsten carbide. Some men even prefer buying ceramic rings. However, these can shatter to pieces if stuck by something hard. Traditional men's wedding rings are plain and simple. If this is your choice, then go for it. These are also quite comfortable especially considering the fact that you will probably be wearing it 24x7. However, if you would like to go for something more stylish, then there are quite a few designer options available. These are available in different patterns and designs. If you like gemstones, you may want to take a look at rings with small diamonds. Of course, as mentioned above, if you can afford to buy a $1000 wedding ring, then go for gold or platinum. But we are here looking for cheap men's wedding rings, so we will stick to bands lower than $100. Decide the price and then go for the ring. Going to the store and checking out the different options is the most preferred way of buying rings. However, these stores have huge overhead costs which they have to pass on to the customer. Basically, they just can't afford to sell it to you cheap. So, you may want to consider going online. You can easily find the ring you want by surfing sites such as Amazon. They have a huge line of wedding rings both for men and women with prices ranging from $20 to $2000. If you order something and don't like it or it doesn't fit you, it is quite easy to order for an exchange in most cases. So, we are all set now to take a look at some fantastic cheap men's wedding bands. Let's get started. Just click on the links to get a further look at the ring you like. Keep in mind that these are only a few options. You can click the links and look for other options on Amazon as well. In fact, you should look for other options because after all you are likely to get married only once. Titanium is quite durable, lightweight, and subtler in color than your gold and platinum. Take a look at few of the most gorgeous looking cheap men's wedding bands. This ring has a width of 8mm but quite comfortable. The matte finish and the nine channel set cubic zirconia gives you a ring that is a little more than the usual plain ones. This one is for the men who like wider rings. 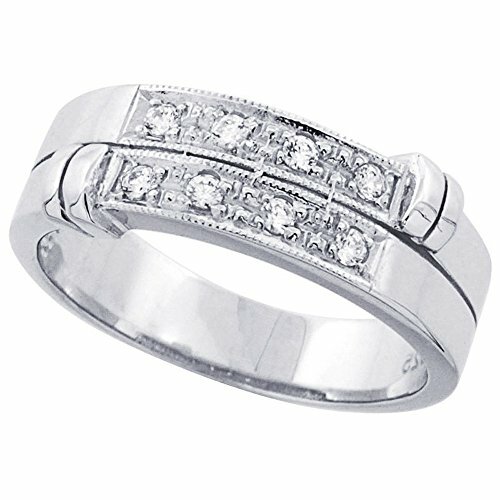 It is a 10mm ring and has three cubic zirconia stones encrusted in the ring with a high polish finish and comfort fit. Make sure to pick the right finger size considering the fact that it is wider than the usual wedding bands. Like gold, but cannot afford it? Then this may be the perfect one for you. This one is an 8mm 18K gold-plated men's wedding band. It is encrusted with cubic zirconia stones to give that diamond look. This one is for men who prefer the traditional plain wedding band. It is just 5 mm in width so it is perfect for you if you are looking for a narrower ring and/or have shorter fingers. Now, let's move on to some cheap men's wedding bands in the metal tungsten carbide. Keep in mind these are hard and cannot be hand engraved. You will need to get these rings engraved with laser. These will last for a lifetime since these are scratch-resistant and do not break or bend easily. 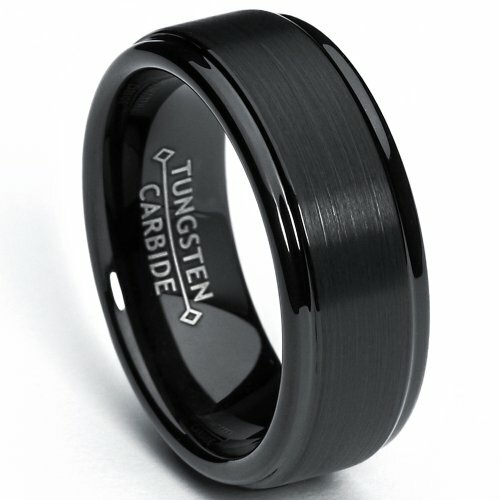 This beautiful band is a black tungsten carbide ring with a high polish and matte finish. 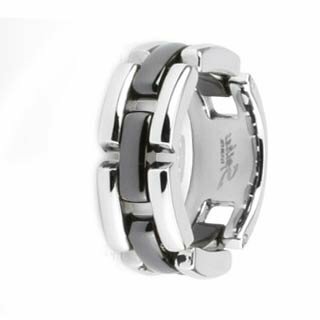 The 8mm band is simple yet quite stylish for men who do not want to go for anything flashy. 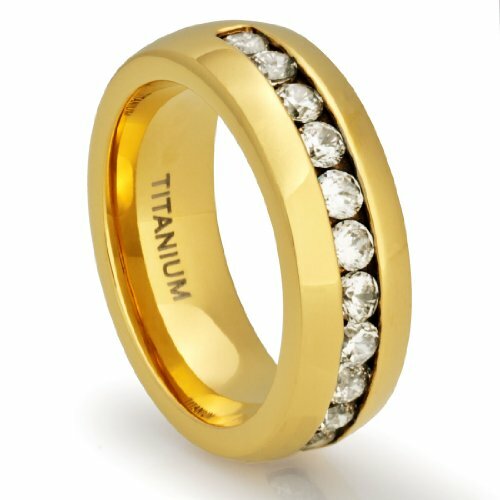 If you don't want your ring to be too flashy or too plain, take a look at this gorgeous wedding band for men. 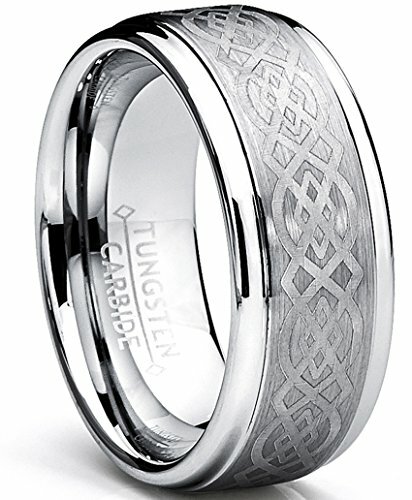 This tungsten carbide ring is 8mm in width and has a simple and unique Celtic design. The etching is quite clear and will definitely look quite attractive on any finger. Looking for some other colors than black? Then try this ring. This one is also 8mm in width with a comfort fit. 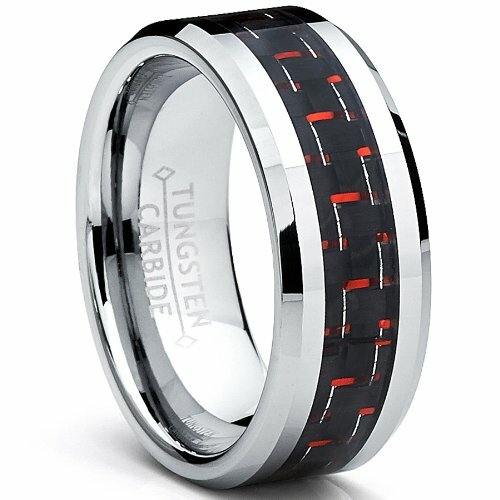 It has a black and red carbon fiber inlay which adds a little bit of color to the otherwise black tungsten carbide ring. There are many attractive tungsten rings for men. These are surprisingly affordable too. Find out what is tungsten and why is it becoming such a popular metal in men's jewelry. Wedding bands made in stainless steel can be bought at very low prices. They can give your fingers a very unique appearance with the different designs available. Take a look at a few stainless steel rings. This one is for men who like that hint of gold in their rings. The ring is 7mm in width and is has a 14K gold-plating. This attractive stainless steel ring is alloyed with chromium which makes its resistant to scratches. The use black ceramic in the center makes this band quite appealing. Sterling silver is often the preferred option for men who cannot afford to go for gold. It is 92.5% pure silver and a polished finish only brings out its beauty further. 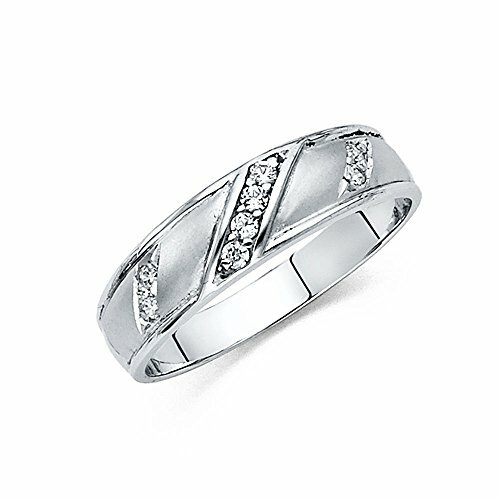 There are many options available in sterling silver and it is one of the most popular metals for wedding bands. These are only a few of the options. Don't forget to look at some of the other sterling silver options on the Amazon website while checking these out. This extremely gorgeous and yet inexpensive ring is plated with 18K gold. It is 4mm in width and its beauty is accentuated with the diamond setting. Available in sizes 8-13, the ring can also be resized. If you don't like the color of yellow gold and would rather go for white gold, try this one which is plated with 14K white gold rhodium. The band is 7mm in width and is available in sizes 10-14. 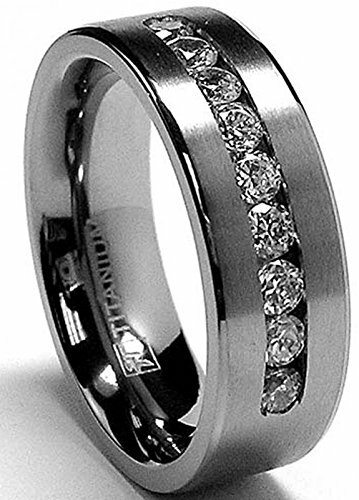 Take a look at this cheap sterling silver men's wedding band. This one is coated with rhodium. 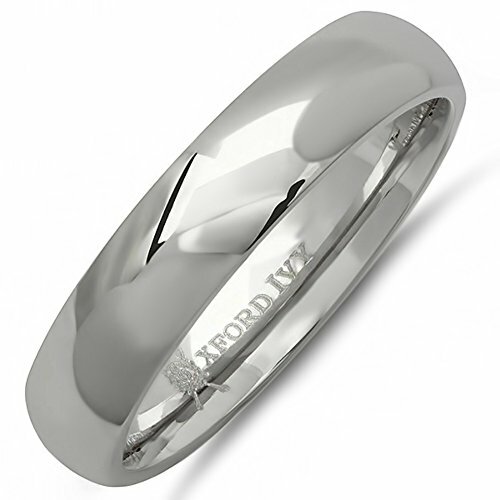 A rhodium coating on your sterling silver band makes it shinier. It also protects the silver from tarnishing too quickly so that you don't have to go for frequent polishing. The cubic zirconia further adds to the beauty of this gorgeous men's ring. 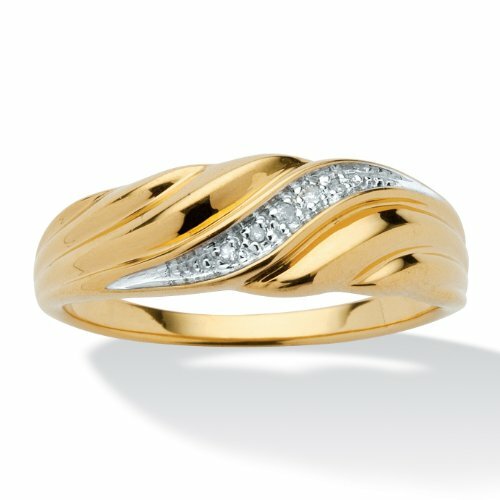 Looking for a ring with a unique design to glorify your wedding? Then take a look at this option. The ring is 10mm in width and 2 mm in thickness. 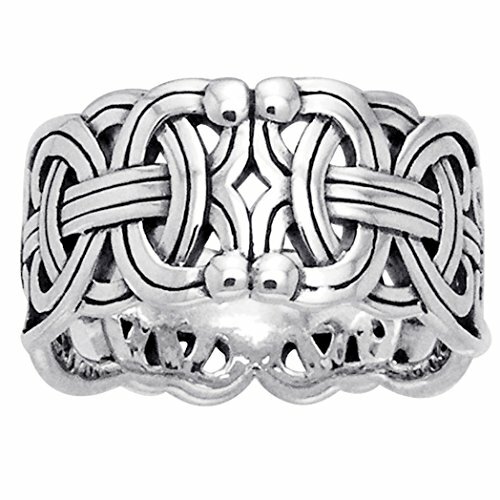 It has a Borre ring braid, a type of a Celtic knot. The Borre ring braid is named after a boat grave in Borre, Norway. So, spend some time looking at these cheap men's wedding bands and take your pick. The above rings are only a few of the thousands of options available at discounted rates that you won't be able to find in a store. Happy choosing and have a happily married life! Which is you favorite wedding ring?